The crew spends an afternoon preparing GPS transmitters with cords that will be tied to turkeys. 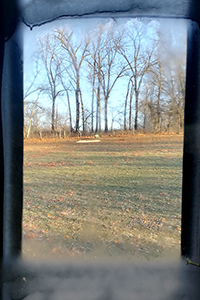 The view from the tree blind. 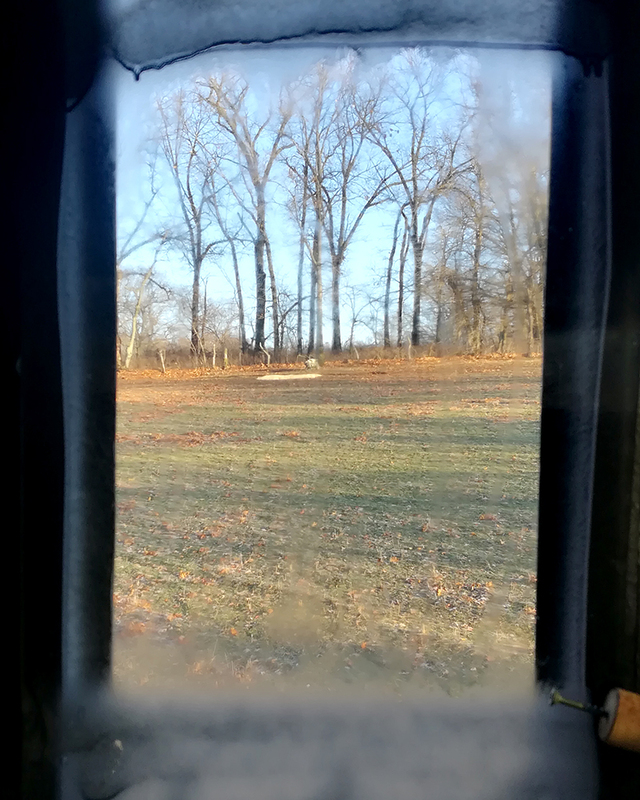 PEARL, Illinois – I scan the woods around me, carefully eyeing the tree-line through the darkened windows on each side of my blind. I see no turkeys and go back to reading my book. After a few pages, I glance up again and jump in surprise as turkeys emerge over a hill in the field to my right. They are about 40 feet from the Netblaster. 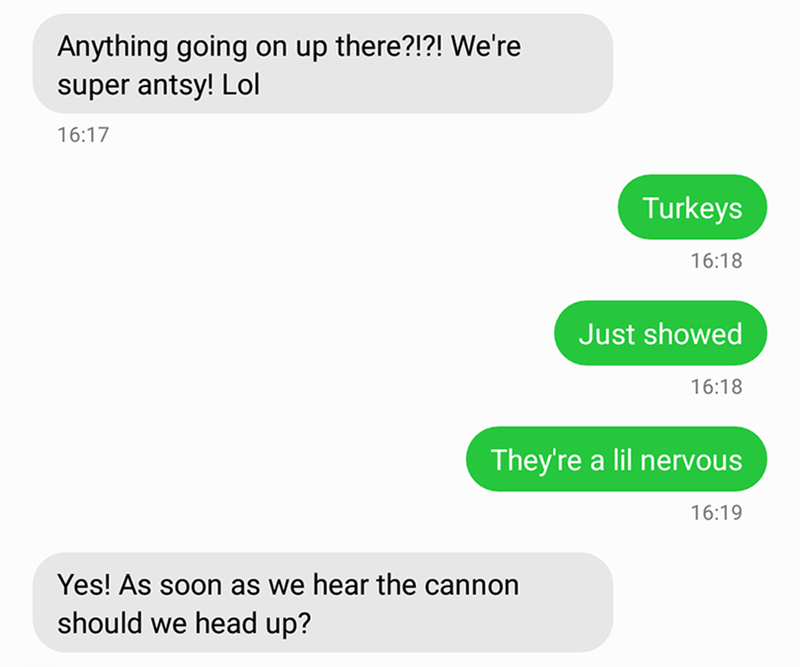 I text my crew to let them know our prey has arrived! 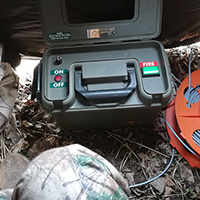 Since 2015, I've spent each winter capturing and tagging wild turkeys with GPS transmitters to study their habitat use and nesting behavior in forests managed with prescribed fire. 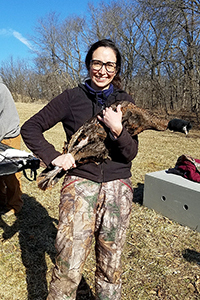 In addition to gathering new data on black flies near turkey nests, we hope to better understand what influences the nesting behavior of wild turkeys and how that behavior translates to nest success. 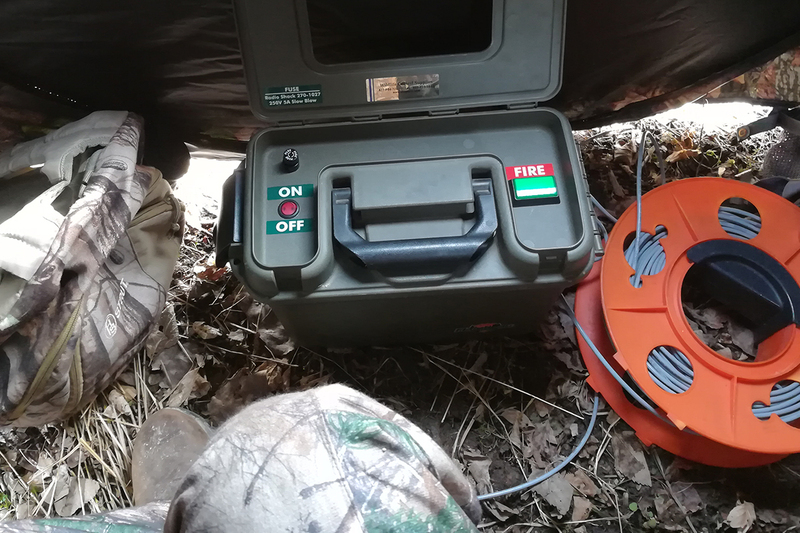 A modified ammo box, the “boom box” is used to fire the Netblaster. To maximize trapping success, we also set up two drop nets at a nearby farm. I’ve been in this platform blind for about 11 hours today. 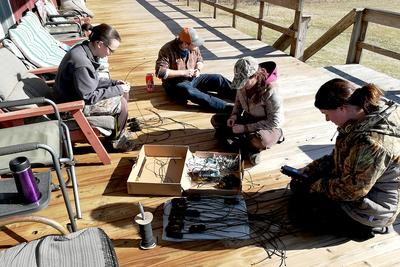 Behind the bait pile of corn sits the Netblaster, a four-barreled cannon that, on remote-controlled cue, will launch a net up and over our prey. The Netblaster looms over a group of turkeys soon to be caught in its net. Piles of cracked corn attract the birds. 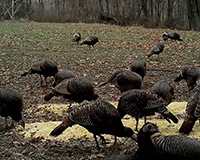 The turkeys walk toward the bait pile with obvious caution: Take a couple of steps. Freeze. Turn an eye toward the Netblaster. Repeat. A flock of hens enjoys a cracked-corn dinner. I see more turkeys beyond a fence. They appear to be seeking a way into the field. The original three turkeys creep closer to the 40-by-40-foot capture zone in front of the Netblaster, and I slowly power up the “boom box,” named after the cannon boom produced when we hit the FIRE button. The button glows green, telling me the Netblaster is ready to deploy. A few other turkeys perch on the fence like vultures, flutter to the ground near the bait, then scurry back to the fence line. 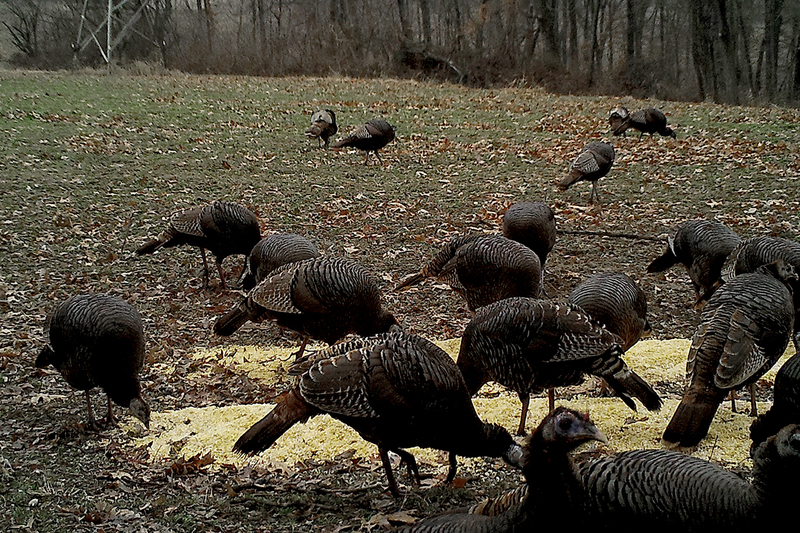 Thank goodness, four turkeys are now moving toward the bait. Illinois Natural History Survey visiting hunter recruitment specialist Kristen Black, left, and natural resources and environmental sciences doctoral student Christine Parker inspect one of their captured turkeys. Feather shape, color and degree of wear are used to determine a turkey’s age. 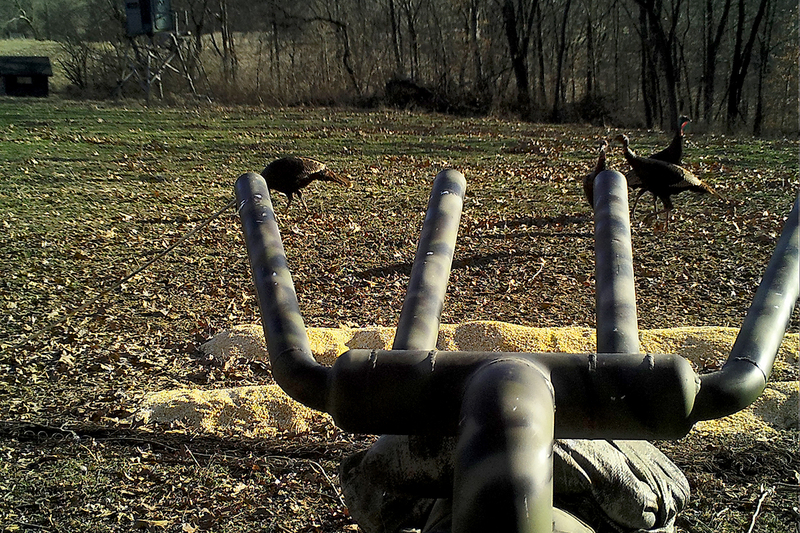 Finally, the turkeys enter the capture zone. 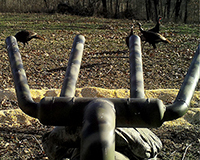 I lean in to fire the cannon as two turkeys wander toward the edge of the net range. I wait for a second, hoping they’ll turn back around. They don’t, and the other birds look nervous. Before they can take another step, I fire the cannon. A loud “BOOM” sounds across the field! 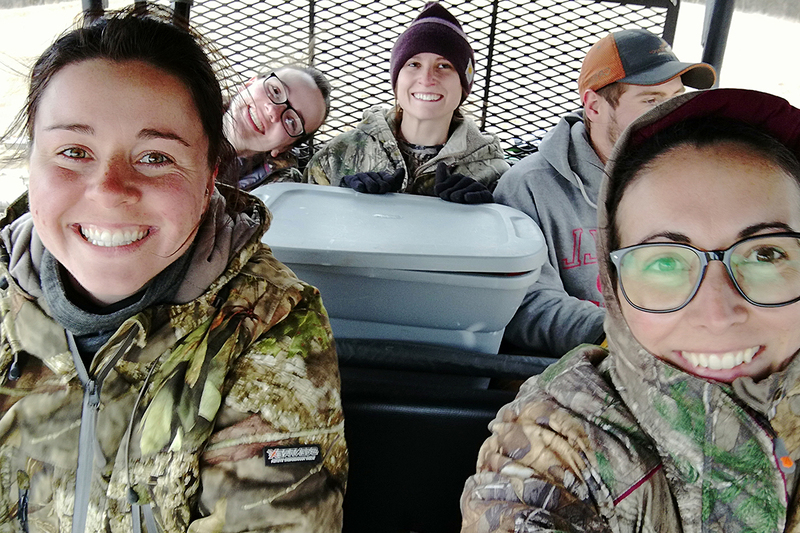 The turkey crew includes, clockwise from front left, INHS researcher Christy Sadowski, graduate student Morgan Meador, technicians Jennifer Majkowski and Danny Erickson, and Parker, front right. I scramble down the ladder and sprint up the hill to secure the four turkeys. My crew quickly drives up to help me. 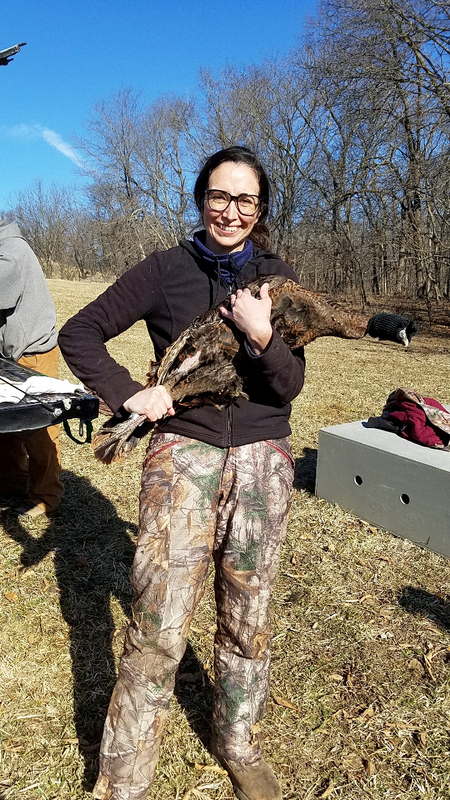 As we untangle the turkeys from the net and place them in a holding box, the crew tells me that one of our other traps also just caught turkeys. 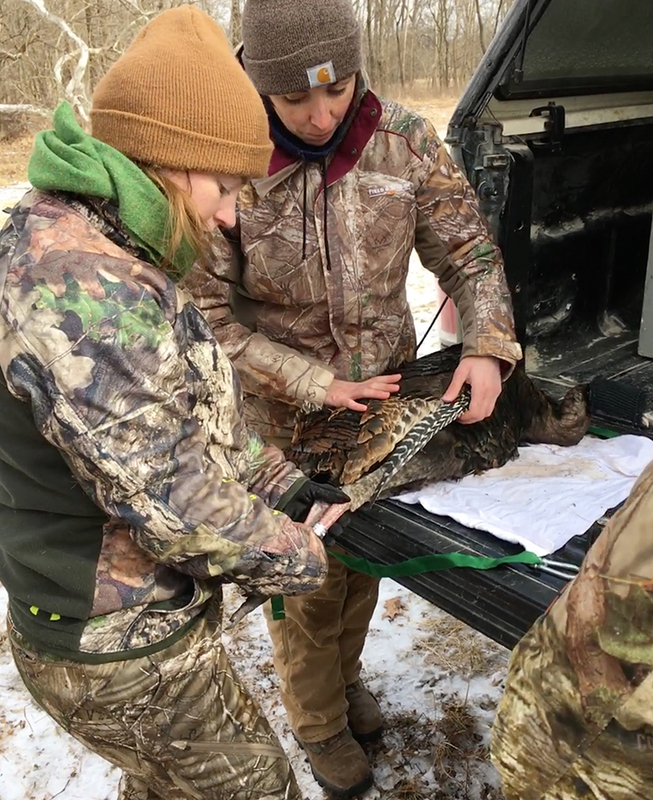 I fist-pump excitedly and we settle down to weigh, measure, tag and release our captured birds.